As anyone who has ever had a toothache can attest, oral disease is more than an inconvenience. In Zambia, constant dental pain is a reality for most adults. Dental care and preventive services are especially scarce in the vast rural areas outside the capital city of Lusaka. 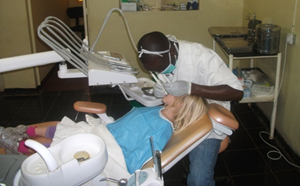 In fact, the entire county of Zambia has fewer than 200 individuals with training to provide dental care. Dental care within any community is invaluable, and as such, our Dental Surgery aims to treat and help the people within our area. Chikankata Mission Hospital has a reasonably equipped dental surgery and is staffed by a dental clinical officer therapist who provides dental health screenings, preventive services (oral health education, toothbrushes, toothpaste, and fluoride treatments), and pain relief (extractions). Through our Dental department we do dental community outreach on oral health and other dental services, although the majority of our patients come to our facility for tooth extraction. This approach of prevention and treatment creates long term improvement in oral health with a concurrent investment in Zambia’s own dental health workforce. Oral health program strategies are based on an assessment of the communities’ needs and designed to be effective and locally sustainable. Our dental health delivery system aligns with the guidelines of the World Health Organization and has been recognized by the Zambian Government's Ministry of Health.